Can you post some screenshot please? This camera is a copy/alternative of Trendnet TV-IP310PI. The WEBUI work fine ? One thing I found playing with this camera is that ONVIF works but the camera has to have both a user name and password set. It would not work with "admin" and a blank password which is default. They can be connected via FFmpeg or via the Remote - RTP/RTSP options. 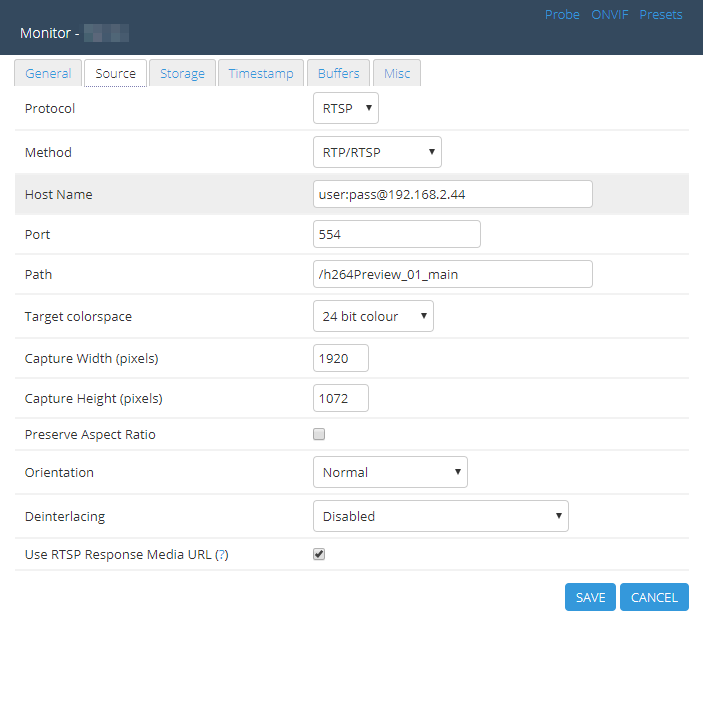 The Remote RTP/RTSP options are much better. iconnor is now in possession of two of these cameras, so he (I) should be able to determine the problem and fix it. One one the picture is perfect, on the other is smears like crazy. Help this? I cant nothing to do with this logs. The only thing i see is that the camera starts and starts and after a while starting was success and it run. I run ZM 1.32.0 from the PPA and my 410WS smears like crazy as well. It's no longer on wifi - bought powerline hoping that'd fix it. Firmware is most recent. I'll happily verify patches if you manage to figure out what's going on. I found this forum post because I'm also having this problem. I have two Reolink RLC-420 cameras, but the issue I'm having seems to be the same as what is occurring with the Reolink RLC-410 cameras. The video smears along toward the bottom and the console page shows the fps is much lower than the camera is actually outputting. I turned the camera down to 15 fps but ZoneMinder is reporting around 2 fps. The camera's low bandwidth stream doesn't have as much of an issue and the ZoneMinder console reports just a frame or two below what the camera is set to. I have two other cameras from Great Wall Security which work as expected. I don't restrict any camera's fps in the ZoneMinder settings. The camera is wired to an unmanaged gigabit POE switch which is connected to a Cisco SG300 managed switch in layer 3 mode. The server is connected to that Cisco switch. There should be no latency issues. If there is anything I can do to help diagnose the source of this problem, please let me know. Same as you guys.... ffmpeg smears like no tomorrow, and RTP/RTSP MIGHT work for a bit, then it goes away and NEVER comes back! What's with the height being 1072? Shouldn't it be 1080?